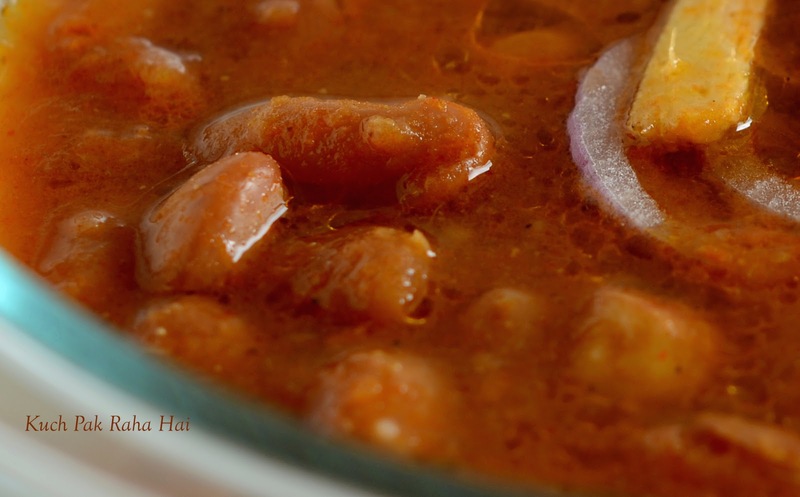 Rajma Masala is a spicy, tangy delicious punjabi curry dish prepared using Red kidney beans. I personally like the combination of Rajma-chawal the most. You can serve it with jeera rice and roti/chapati also. Rajma or red kidney beans are not only tasty but healthy too. It is a rich source of proteins, fibre and magnesium. Some people complain that it is difficult to digest or cause bloating/gas problems. To answer this query, I would please request you to soak Rajma overnight. This releases all the phytic acid into water which otherwise hinders in digestion. Discard that water later on. Do not use water that was used in soaking. Also the use of asafoetida in recipe aids in digestion of Rajma. Hope you would like this Rajma recipe!! 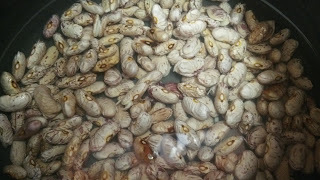 Soak kidney beans in the water for at least 3 hours. It would be best of you soak them overnight. Discard away the water in which the beans were soaked. Add fresh water and salt to it. 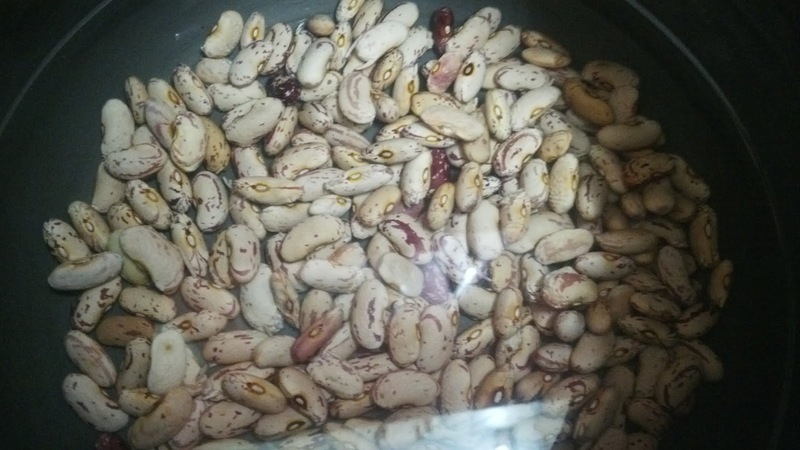 The water level should be just double the level of kidney beans. Give it one whistle and let it stand aside for an hour or so. 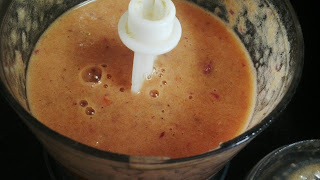 In a blender or food processor, puree together the onion, tomatoes, chillies, ginger and garlic paste. 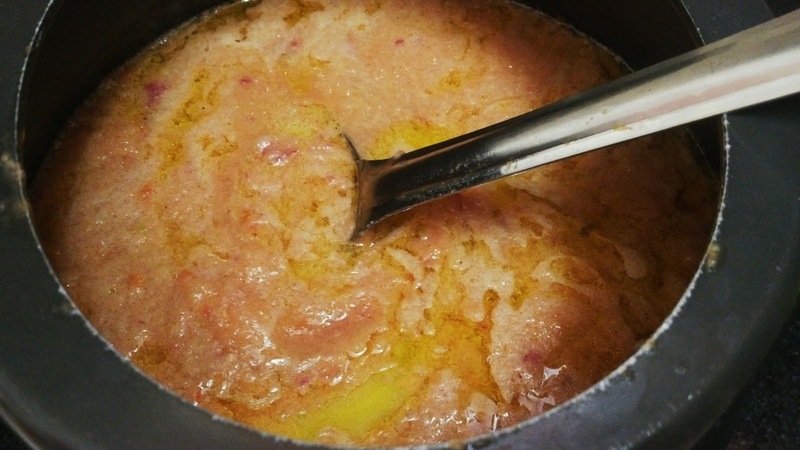 Add this puree and ghee to the cooker. Also, Add all the spices-coriander powder, red chilli powder, garam masala, mango powder,turmeric powder,cumin powder and asafoetida also. Mix well. 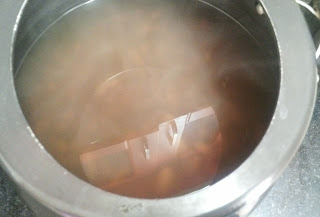 Close the lid of the pressure cooker and give it 4 to 5 whistles. Turn the flame to low, and let it cook for another 30 minutes. Switch off the flame. Once the pressure is released, open the lid of the pressure cooker and let it boil for another 5-10 minutes depending on the consistency you like. Rajma is ready to be served! !